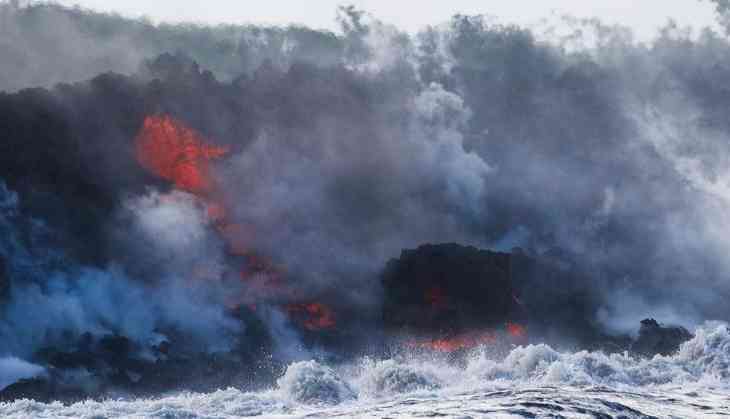 Lava flowing from Kilauea volcano on Hawaii's Big Island is heading towards a Puna Geothermal Venture (PGV) plant, which provides about 25 percent of the Big Island’s power. This plant was shut down shortly after the volcanic eruption that started on May 3. Only three wells are to be closed. Workers are trying to shut down the three wells that are at nearly 6000-8000 feet underground. This plant stores 227,124 litres (60,000 gallons) of flammable pentane which is used in plant's turbines. If lava reaches the geothermal plant then there would be an uncontrollable release of toxic gases. Hawaii Governor David Ige said, "We do want to shut down the wells so that we would eliminate the broader risk of uncontrolled release of gases and steam from the plant,"
Until now a berm was keeping back the fast flowing lava from flowing northwest of the PGV plant but the workers who are trying to shut the three wells are facing difficulties.